Containing a selection of the stunning illustrations of the complete edition labeled with the same accurate terminology in up to two languages, The Mini Visual Dictionary, in this abridged version, contains 60% of the complete edition’s content. 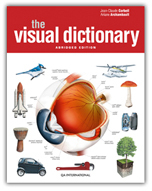 This volume covers the same 17 themes as The Visual Dictionary's complete edition in a convenient format. experts and highly skilled illustrators.